James "Jim" Franklin Millsaps, 80, dies peacefully, surrounded by family on April 13, 2018 in Chattanooga, TN. He leaves behind his wife of 62 years, Elizabeth Moore Millsaps; daughter, Maria Millsaps Harris and husband Fred Harris; daughter, Cherie Gilchrist; and son, James Millsaps and wife Cheryl Millsaps. James was born on May 9, 1937 in Bakewell to James Thomas Millsaps and Ollie Virginia Simmons, who proceeded him in death. He was raised in a loving family with his two sisters and brother. James is survived by his wife and children; his sister Sharon McWilliams; as well as 7 grandchildren; 11 great grandchildren; and numerous nieces and nephews. James loved to love on people. 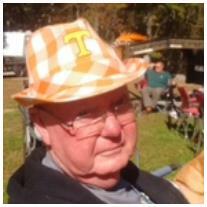 He was a strong, generous man who was passionate about his family, black coffee, VW beetles, and the Vols. His hands were rarely still, always building, tinkering or fixing something. In addition to a good work ethic, he instilled in his family a zest for life, the impact of a smile, and the power of a great, big hug. A lifelong resident of Soddy Daisy, most would recognize James by his signature every day look: a plain t-shirt, denim overalls, and slip on shoes. He was affectionately known as Grandpa. He was a boilermaker with International Brotherhood of Boilermakers Local 26, a member of the Daisy Masonic Lodge #706 F&AM and the Alhambra Shrine Temple, where he served a past President of the SESA Horse Patrol. He was an active member of the Middle Valley Church of Christ. Family will receive friends for visitation on Friday, April 20, 2018 from 4-8 pm, and Saturday, April 21, 2018 from 11 am-12:30 pm at Williamson & Sons Funeral Home in Soddy Daisy. A Celebration of Life Service will follow at 1 pm in the funeral home chapel with Larry Clements officiating. Burial will follow at Hamilton Memorial Gardens. Grandpa's wish was for you to spend time with your loved ones.